Gillette, after being acquired by Proctor & Gamble (P&G), was in the middle of moving some of their purchasing from Boston to Ohio when we met a buyer who was having difficulties with an existing supplier securing proper samples for a NE Product Launch for the Venus Razor. She had fallen behind in finalizing the perfect packaging for the initial promotion of the program. 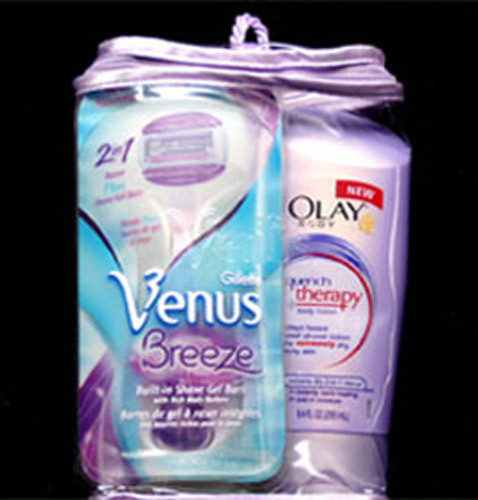 The desired packaging would consist of printed collateral, a soft-sided clear printed bag and a promotional piece. She would have had to deal with a minimum of three different suppliers and coordinate the delivery of ALL the components to P&G distribution center within a very short window and had zero margin for error. We met the buyer late Friday and by the following Tuesday had delivered various samples of creative packaging that we had briefly discussed prior to the weekend. The buyer chose a package her team liked and we went into production. We sourced and manufactured ALL the components and coordinated delivery to our fulfillment center to save time, money and meet the “in hands” date. She needed to deal with only one company….SOURCENTRA! The order was worth $750,000.00 and we literally saved the day for the team at P&G.